I understand you have concerns regarding GOF's financial transparency. I said I'd be more than willing to provide you with (to the best of my abilities) information regarding our organization's current financial status. However, I don't feel referring to our upcoming Halo tournament / LAN as "EmbezzleLAN" is at all appropriate. I know you have close ties with MPcon, and I can understand not being happy over the fact that our LAN is taking place the weekend before MPcon's July event. However, insinuating embezzlement is an entirely new level of seriousness, and frankly, I would go as far to say that your recent blog borderlines defamation of character. Your blog is written in such a manner that seems to suggest Gamers Outreach has purposely been attempting to hide or misrepresent its financial details, when factually, that is not true at all. Questioning efficiency is one thing, but embezzlement? That's fairly extreme. Let me begin by stating that, in hindsight, the title I had chosen for Sunday's article was poorly selected. "EmbezzleLAN" is a colloquialism that had been coined in reference to your con jokingly when issues first had arisen regarding the monetary situation. It was with tongue firmly in cheek that I entitled the piece as such, however, the issue is entirely too serious for such a jest to be acceptable. For that I apologize. It bears mention, however, that at no point in the piece did I accuse you of embezzlement; and while I do not consider the notion outside of the realm of possibility, that is merely my opinion—and a largely ignorant one, since I have no financials with which to evaluate such a claim. The title was needlessly prejudicial to the audience, and as such has been changed. That having been said, there is absolutely no defamation of character. I feel entirely confident that not a single statement that I have made is untrue. I did not suggest that GoF has been misrepresenting its financials. I reported the facts. The fact that when even YOU read the facts, you come to the same conclusions that I have should be a warning sign that something is amiss. I have left the conclusions up to the reader; you, as the reader, have come to the conclusion that things look dicey over there. All I can do is applaud your astute powers of observation. Near the end of your blog (point 2.) you state "Even interested staffers of the events in question have been unsuccessful in obtaining these financials after months of attempts." In actuality, no one from MPcon has ever requested to see our written financial records prior to Jeff making a request via e-mail on April 21, 2009. (See attached SS: Jeff's Request). If MPcon's concerns have existed for such a long period of time, (as you have stated in your blog) why didn't Jeff represent the interests of MPcon and ask to see our books during our first board meeting? It would seem to me that if MPcon was as bewildered as you say they were, they would've wanted to see our books back in 08 when they agreed to merge with us. Rusty gave a financial report at each of our meetings, at which time, Jeff could have easily asked to see specific numbers / receipts on paper. As a board member, Jeff was more than welcome to look over the individual expenses and receipts of our organization. Jeff was also sent our Form 990. This is, without a doubt, an absolute lie. To begin with, I asked for the financials of the organization on the 16th of April on behalf of MPCon during a discussion with you in the parking lot of the Fairlane Campus of the University of Michigan-Dearborn. Prior to that, Jeff had requested the records more than once verbally; at least once in my presence. The mistake made was in not getting the request in writing. Unfortunately, the past is the past, and we cannot change that. I think it is safe to say that all of our requests for information have been thoroughly documented at this point; so why do we not yet have the records? Prior to the aforementioned sentence, you state "...however I have been unable to get a copy of the financials despite having asked for them. " This statement does not properly represent the timing of your request in relation to the time at which you posted your blog. 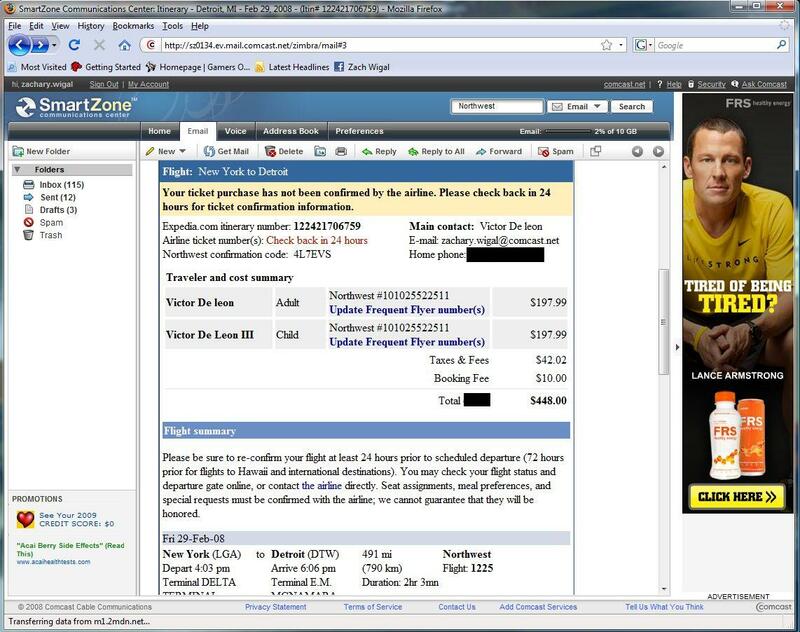 You asked for financial information on May 9, 2009 via facebook (SS attached). Your blog was posted the following day. With consideration to the timing of your request in relation to your post, citing the fact that you didn't receive a response from me regarding our financial information (on a weekend) as means for evidence to support your insinuations / accusations seems unfair to me, if not faulty. Well, better late than never, I suppose. Perhaps you could have been searching for that information since the 21st of April (which is when even YOU admit to having finally heard a request for the data.) Further, should you have to protect the privacy of your donors from a board member that asked for this information on the 21st? "By the time a donation was made that was actually $4,000 of the $14,000 in revenues, the folks at MPCon found themselves very confused. If they bore the brunt of the infrastructure costs, where did all of the money go? " GFG 1 served as both an event to help generate funds for the ASW, as well as the kick off event to help jumpstart GOF. Revenue from the event was roughly $15,000.00. Part of the funds were spent on event expenses, part of the funds went towards repaying GOF start up costs, and the rest went to the ASW. Loreine Wynn from the ASW was aware of the fact that throughout the event planning process, GOF had expenses it would need to pay. Our fundraising goal was $7,500.00. We were not able to meet our goal, however, we were able to generate $4,000.00 which was directly donated to the ASW. We've never hidden that fact from anyone who's asked "how much money from the event was donated to ASW?" 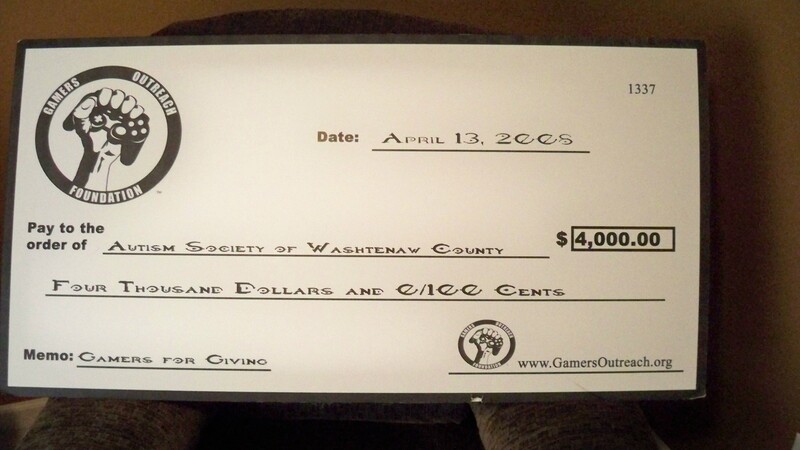 We wouldn't have made a giant check (see attached—022) to present to the ASW had we been trying to hide that fact. Shane from PWNED Radio has photos and video footage from our post-event interview with ASW regarding the money we donated. It should be also noted that MPcon did not bear the brunt of infrastructure costs associated with GFG 1 as you state they did. GOF paid for the room rental. GOF also paid for our special guest's hotel rooms / plane flights ( that is where my loan repayment comes from. GOF did not have the money before the event—see Vic's plane ticket—I also lent GOF money to pay for printing flyers for the event). Additionally, GOF paid for the majority of the materials MPcon said they needed for the LAN. (tape, pens, etc). You will have to forgive my disbelief. I have no financial information from your organization through which I could verify or argue that point. Further, your explanation indicates a somewhat loose definition of “infrastructure” in my opinion. I will be happy to debate which organization bore the brunt of those costs when and if financials are ever provided. In point of fact, however, this is the most minor of quibbles; so much so that I am more than willing to entirely concede the point if it will focus your attention on the much more pressing issues at hand; your actual financial situation. "...a $1,200 loan made to the charity from Zach—presumably the result of rigorously saving minimum-wage paychecks for months. " Your presumption is correct. I served my time at GameStop. "$10,000 went to a down-payment for a website." "Nearly $3,000 went to unexplained 'fundraising expenses'. " Such as supplies from office depot, u-haul truck to transport monitors from port huron at GFG 1, gamers outreach t-shirts, (we were working with underground printing at the time—mythlogic had suggested we go with them. Now however, Kiaeneto donates our clothing items) tax software to report form 990—etc. "items like XBox 360s and televisions or spending tens of thousands of dollars on a new web presence"
See document7, which lists the Hanspree monitors we purchased along with the Xbox 360 vga cables. The receipt for the Xbox 360s is physical, and is not on my PC at the moment. As a game industry charity, our program expenses do sometimes involve purchasing gaming equipment. Whether it be to aid in fundraising efforts, (i.e.—we believe we can make a significant return on the Xbox 360s) buying games for our gaming kiosks, (currently working with Howard Medical to create a cart based off of their HI-Prodigy design http://www.howard-medical.com/carts/poc/hi-prodigy/— we also have discussed using the Xbox 360s / monitors to outfit some of the kiosks) it's what we do. To help give us a jumpstart, Rusty offered to loan us the funding needed (at no interest) to purchase supplies and equipment. At our last board meeting, (which Jeff was present at) we discussed establishing a budget for the organization now that we have acquired funds thanks to GFG. A budget will be established once we have determined the price of our mobile gaming carts so we can allocate our resources appropriately, slowly pay back our loans, and begin growing and becoming more efficient. "The email was met with a rather ominious silence for over a month— until MPCon settled on a date for their Summer LAN at which point the old saw about no good deed going unpunished was illustrated by the staff of Gamers Outreach." The LAN has been scheduled for the past few months. I should know—Gamers Outreach is the organization that had reserved the ballroom. It wasn't until the recent e-mail threads emerged that our philosophical differences became completely apparent. Originally, we had hoped to run the summer event as a GOF event, being presented by MPcon. However, with lingering tensions, we felt it best to just completely hand over the EMU event to MPcon. Still wanting to host a summer event, we decided to host a smaller event to test our potential GFG venue. The unfortunate circumstance (believe it or not) is that in order for us to host a summer event, the earliest it can be done is the weekend before MPcon (without our event being on the same weekend as MPcon). We'd like to host a fall event (assuming the summer goes well) and we feel like moving into the August / Sept time frame starts to cut into that hope. Jer, if you're just looking to harass GOF or sling mud around, than ultimately any effort I make to send you receipts / explanations is futile. Perhaps you think we're a bunch of amateurs running an organization, fine. Perhaps you believe our organization isn't very efficient. Fine. Maybe you aren't interested in our initiatives. Fine. But I am saddened to know that you would question my honesty and integrity. I have always tried to be respectful of you when you have offered your opinions on various topics. If your intentions are to accuse GOF of embezzlement, I would've appreciated you coming to me first and asking for receipts vs posting accusations based off of suspicion on a publicly accessible blog. I have saved the remainder of my commentary for here; wherein I will summarize the salient points. 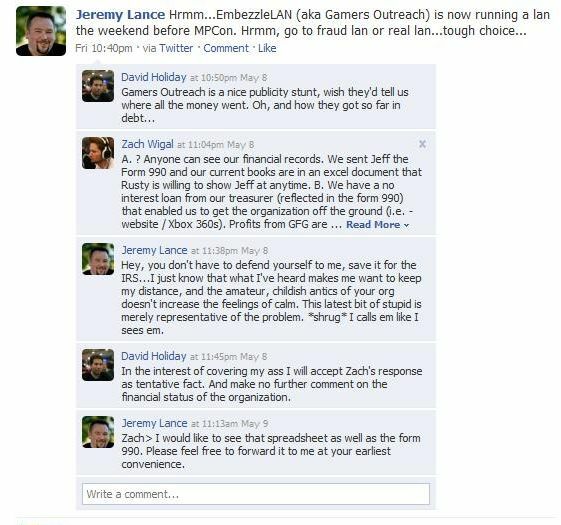 Zach, you still have not provided the financial records for your organization to me, to any of the others that have asked, or even to a member of your board who has been asking for more than enough time. Surely you do not have to find a way to shield sensitive information from a member of your own board, do you? If not, why has every member of your board not been supplied with this information. I will ask again, why is it so difficult for anybody to see these records that you profess to be so easy for anyone to obtain? Of similar importance is the following; why are you so focused on (nonexistent) accusations of embezzlement and fraud? Let me explain. The worst-case scenario is that all of the secrecy and hidden expenses exist to hide some form of fraudulent or otherwise illicit activity. That is a pretty bad worst-case. The bad part, however, is that the best-case scenario is that you guys are mismanaging a charitable organization to such an alarming degree that it is able to donate far less than 50% of its take to an actual charity. That's right, for each dollar that finds its way to a charity through your organization, more than one dollar does NOT go to a charity. well, that organization is not really a charity in my opinion. Finally, the very real concern remains that your father is on the board, is the treasurer, and holds the note on the loan. That is, at best, a grotesque conflict of interest. It is, at worst, insane negligence. The Better Business Bureau has a Guide for Charity Evaluation, and standard number five discusses No transaction(s) in which any board or staff members have material conflicting interests with the charity resulting from any relationship or business affiliation. You know, like a huge loan? Or a series of big loans? Zach, you summarize your email with statements casting aspersions upon my intentions and implying that this is a mean-spirited attack or an act of vengance for a perceived wrong. I will summarize my message by restating the facts: your “charity” is withholding information from the public and, indeed, from its own board. Your “charity” is plainly mismanaging its money in some way; I cannot tell if it is willfully or simply negligently, but there is no question that it is happening. Finally, there is a distinct conflict of interest at the highest level in your organization. Your insinuation that there is some “defamation of character” and the admonitions by your cronies that I am participating in “slander” are amusing, wrong, and unacceptable. I am stating the facts as they exist. The solution, if you feel my numbers are in error, is to address those; preferably in the form of publicly available financial records. This is posted publicly, as was my previous article, in an effort to ensure that this entire process is handled as transparently as possible. I have absolutely nothing to hide; it is my hope that you will take this opportunity to open up your finances similarly. But I will not be holding my breath. The saga continues, read more in part 3, in which the 2007/2008 books are released!